Light of the Hill United Methodist Church of Puyallup, Washington, hosts a screening of Inlaws & Outlaws on Sunday, April 5, 2009 at 6:00 pm. The screening is free and open to the public. The church is hosting the film as part of their discernment process and welcome the community to join them in dialogue. When: Sunday, April 5, 6 pm. How: Open to all. Free will offering accepted. "Our mission is sharing God's light through worship, study, and service. 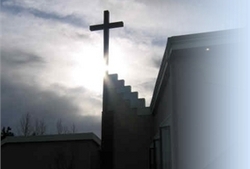 We are a connectional church in ministry with 250+ United Methodist churches serving God in the state of Washington and the panhandle of Idaho. Together we can do far greater things than any one individual congregation could do alone, but our mission and ministry begins at home and reaches worldwide."